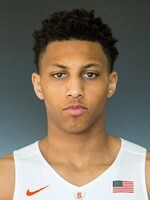 Matthew Moyer was a forward for Syracuse University basketball for one season. Moyer injured his foot during the summer prior to his freshman year. His foot healed, but he had missed a lot of practice time; that, combined with the abundance of forwards on the team, led him to redshirt his first year. Moyer begain his first season as a starter. He demonstrated a lot of hustle and decent rebounding, but limited offensive skills. He did show the ability to aggressively attack the basket. He had his best overall game of the year leading the Orange to victory over Connecticut with 18 points and 8 rebounds. He would later have a season high 13 rebounds in a win over Virginia Tech. Moyer would hurt his ankle in early January, and that would hamper his ability to play for the remainder of the season. Marek Dolezaj would take over Moyer's starting position, and Moyer would be a reserve the remainder of the year. Moyer was disappointed with his playing time, and transferred to Vanderbilt. He would be granted a waiver and permitted to play immediately. Moyer would be a solid reserve for the Commodores his sophomore year.